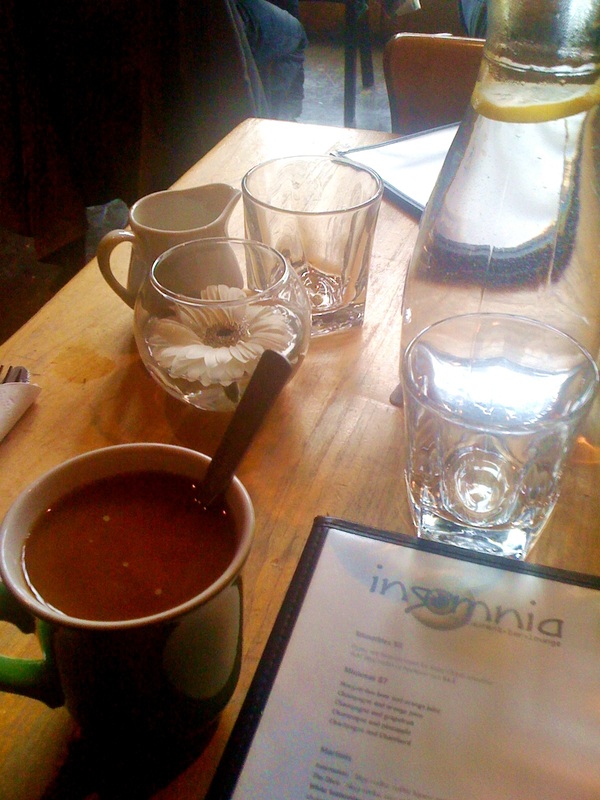 I have been hearing a lot about Insomnia Cafe on Bloor and Bathurst. Being a brunch fanatic it only seemed right to visit this establishment. Prior to making this decision however I decided to peruse their menu online. I considered it a big plus that Insomnia has a website with a menu that also includes prices. After studying their menu I felt there were sufficient options to make the trip over. Sadly I forgot my camera, but decided to use my iPhone instead. Not the best pictures, but you hopefully will get the gist of our order. I arrived 10 minutes before my friend did, so I ordered a coffee to start. I made sure to confirm with the waitress that they had unlimited coffee refills. To my relief, they did. Lack of unlimited refills would have warranted my exit. I know it seems extreme, but after visiting many brunch restaurants, this type of service is expected. My friend arrived and ordered an orange juice for $3.00, while I inquired as to whether the coffee had cinnamon in it. I could not tell if the cinnamon was coming from the coffee or the sugar. As it turns out their coffee has a hint of cinnamon. I actually liked the taste, but some may find an issue with this added ingredient. I generally like to order a sweet and savory option. Unfortunately there were no sweet side options. If I wanted to get something sweet I would have to order off the regular menu. I was not happy about this since the prices for each menu option already ranged from $7 plus. My friend noticed a child’s section to the menu and pointed out how there was a sweet option called “Mini French Toast” that should satisfy my sweet craving for $4.50. However, since I am not 12 or under, I needed to talk my way into it. It actually did not take any arguing on my part to get the “Mini French Toast.” So our order consisted of “Heaven on Earth” for my friend and the “Eggs Benedict” and the children’s French toast. My friend was enamored with her French toast. It consisted of berries, cream cheese and syrup. My Benny was pretty good. It had a good portion of potatoes lathered in a sauce that bordered on heavy ketchup (my friend was not a huge fan and she compared it to Ketchup Chips), a light salad of arugula, and a hollandaise sauce that was satisfying and not too rich with a hint of citrus. My French toast unfortunately was a letdown. The bread was too dry, that not even a strong dose of syrup was able to nourish. I suspect a longer soaking time in milk and eggs would have rectified this problem. Generally my friend and I like to take our time during brunch and catch up on the happenings of our week. However, this restaurant seemed to be very popular that we were distracted by the line that circled onto the sidewalk. Maybe it was not the staff’s intention, but we felt rushed. So we promptly paid the bill and headed to the Cafe next door. All things considered, we were satisfied with our meal. 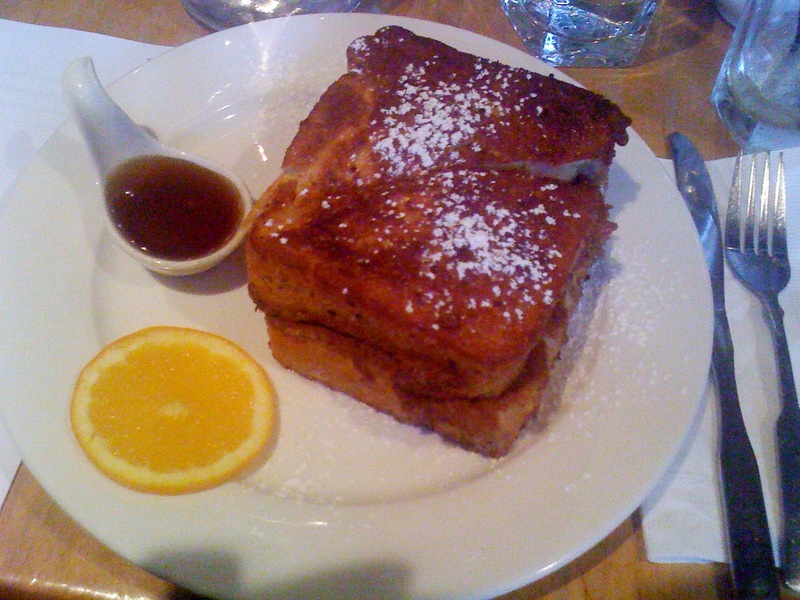 Some hits and misses on my end, but considering that I was already pretty full by the time I got to the dry french toast, it’s lacking texture did not really affect my overall satisfaction of Insomnia Cafe. However, if you are looking to relax and have a leisurely meal in a cozy and private environment; this is not the place for that. For leisure I recommend the Green Beanery next door. It’s lofty interior, ample seating, and space between tables and chairs makes this coffee shop/store a great environment for relaxing, enjoying a great cup of coffee and for stimulating conversation. Do not be deceived by its exterior. We also thought it was only a store, only to be pleasantly surprised! 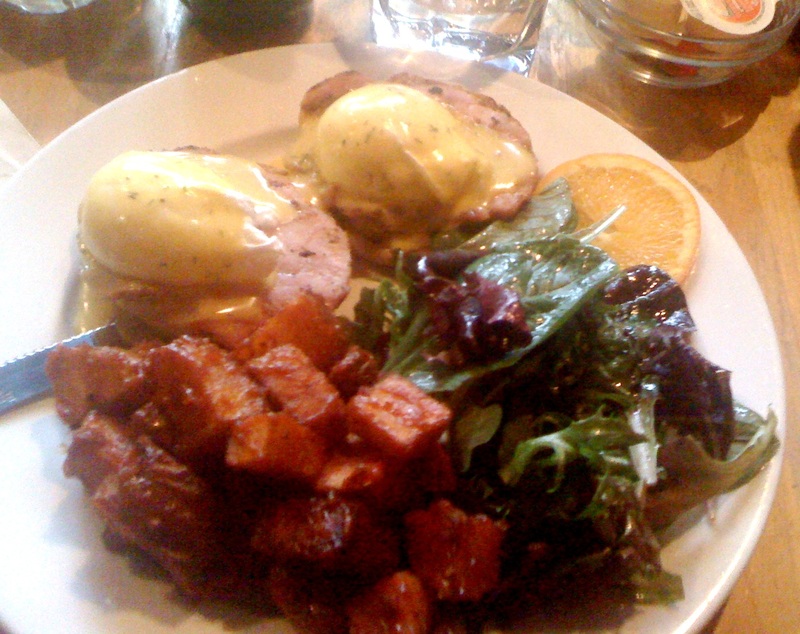 What is your favorite brunch restaurant? Pilot? I have never heard of it. I will look into it! I didn’t think Insomnia was a bore at all. We generally enjoyed the food, but I found the coffee too strong for my taste. But maybe that’s just me. We’ll go back, but next time I’ll take tea. Thank you for your message and lovely feedback! Great to hear you had a good experience here.